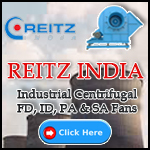 Industrial Fan contains various rotating and sliding parts which are to be maintained regularly for longer life. Regular maintenance also prevents unexpected accidents happening in the system. Some basic maintenance steps of the industrial fan are as follows. If bearings are not properly lubricated, it will produce noise and fail easily with high rate of material wear. Lubrication should be done as per the instructions of the manufacturer. In case of oil lubricated bearings check the quality of oil and if necessary replace it with another one. In the case of grease lubrication, over lubrication will cause overheating. Bearings should be protected from contamination. In case of belt driven fans, wear rate of the belt is high and they lose tension reducing their transmission efficiency. As the time continues the wear increases and produces noise which is due to energy loss of belts. Belt inspection is important in case of large fans because of the amount of power loss. For example, in a 400 HP fan 10% loss in power results in 40HP power loss, which intern results in further decrease in power if not inspected regularly. Motor is the important part of a fan which gives the necessary rotating power to the blades. Regularly maintained motor too have a finite life because overtime usage of the motor results in the breakdown of winding insulation. Motors suffer insulation break down if winding temperature exceeds rated value for a longer period of time. When it comes to either replace or repair of the motor, many factors are to be considered such as size, type, period of operation, electricity consumption etc. The level of performance decreases due to the contaminant deposits on the fan. If contaminant deposit is not uniform, it results in unbalance problems and drive train wear. Contaminant deposit is mainly seen in the ventilation systems. Fans that operate in heavy loads or high moisture air streams, should be regularly cleaned. Fans like, backward inclined airfoil are highly susceptible to contaminant deposit. These deposits disturb the airflow rate, increase the operating costs and decrease the efficiency. In material handling or in moisture content applications radial blade, radial tip blade and forward curved blade types are mostly used because of their resistance towards deposits of contaminants. Leakage degrades system efficiency and performance. Leaks are developed in flexible connections and in places where the vibration levels are high. Leakage results in poor delivery of air or gases to the destination points. This intern results in the overall decrease in efficiency of the system. Leakages points such as improper fittings, cracks in duct work and other flexible joints can be easily identified by inspecting visually. Maintenance of a mechanical system result in increasing the life of an entire system, prevent any extra investment to the organization and provide safety to the work force in the work environment. 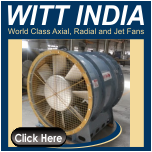 Fans for Tunnel and Underground Ventilation – Witt India Pvt. Ltd.